BEGONIA Duplex Pool Suite is a Double Storey Air-Conditioned Villa (Sky Villa + Pool Villa), boasting the refreshing view of the Tropical Rainforest. It has its own Infinity Pool interconnecting the Main Pool. 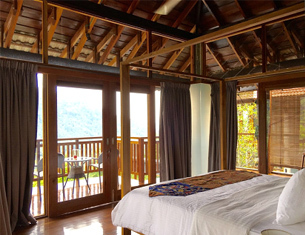 BEGONIA SKY VILLA (upper floor) consists of One Air-Conditioned Bedroom with a King Sized Canopy Bed and a spacious Bathroom with Vanity, WC, Hot Shower and Long Bath. 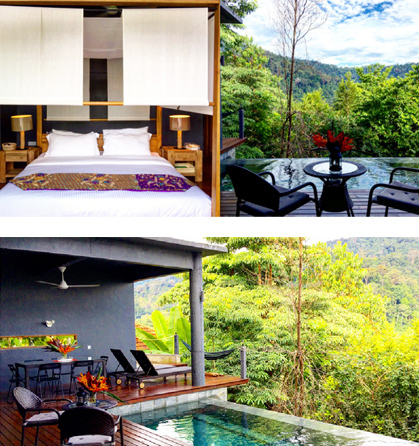 It has a Sky Terrace overlooking the rainforest. BEGONIA POOL VILLA (lower floor) consists of One Air-Conditioned Bedroom with a King Sized Canopy Bed and an en-suite Bathroom with Vanity, WC and Hot Shower. It has its own Pool (adjoining the Main Pool) and a Private Cabana.